Those who use Gmail regularly are often distraught by the fact that the compose 'New Mail' box comes at the right hand side of the screen like a chat window albeit a little bigger with hidden formatting tools which only show when you hover above them. 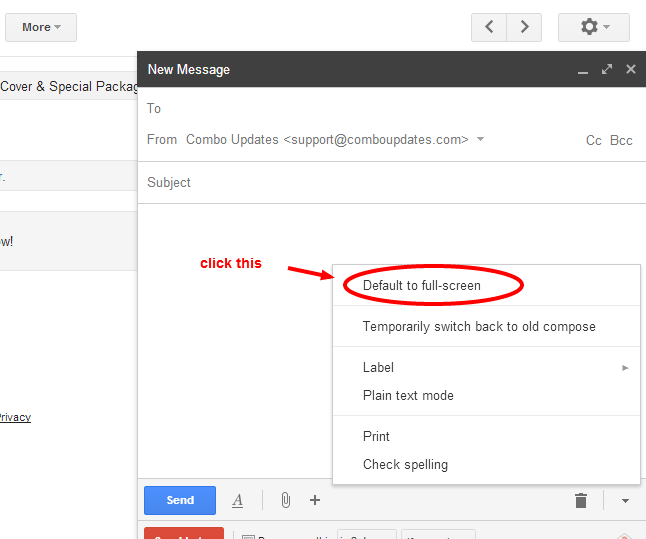 Well now Google has updated is Gmail services and now you can compose the mail in a full screen. This is a easy step guide to enabling the full screen compose mode. When you enable this option the compose box will fill the centre of the screen. If you like it the old way you can toggle it via the arrow at the top right. However the new bigger compose window has new formatting options on the screen which were hidden in the Chat like window earlier. You can also minimise the Compose window as earlier so you can refer your old mails if you have to. The update also now lets you see the profile pictures of your contacts while adding them to the recipient window. This way the margin of error of sending mail to wrong person or wrong id is minimised. You can drag and drop the new address chips between to: cc: and bcc:. When you are done adding recipients, the address bar collapses automatically. As I said earlier the hidden formatting tool bar in the earlier window is now open by default which will help you in selecting your formatting tools easily. I have received the update. Have you? Easy way to check out whether you have received the update is like I have given in image 2 above. Hell, this is a vool article about gmail, but I like professional mail always.